Popular Philippines holiday destination Clark Freeport will again host the 2013 Hot Air Balloon Festival. Organizers remind visitors to book hotels and transportation well in advance. 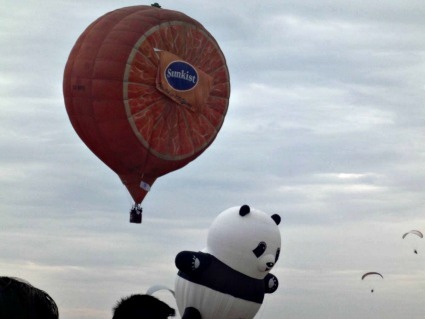 Philippines Hot Air Balloon Festival brings excitement to and attention on Clark Freeport, Pampanga. Clark is normally peaceful and quiet suburban town that Manila residents visit as a getaway destination for day trips and overnight excursions. Situated north of Manila in the province of Pampanga, Clark is very accessible from Manila and Subic. This year there are several packages that make it easier and more comfortable for everyone to enjoy this year’s Clark Hot Air Balloon Fiesta. These packages address visitors' requirements for hotel accommodation, bus transfers, parking, getting their admission tickets in advance to avoid long lines at the gate, lunch, breakfast and other dining facilities. Visitors are well advised to purchase tickets to these special services in advance because it is unlikely that all the visitors can be accommodated. Clark is a popular holiday destination not only for the popular Hot Air Balloon fiesta each year. Clark Airbase or Clark Air Field as it is also called, is well known for its international airport DMIA, splendid golf courses and casinos, spacious resorts offering plenty of clean and safe outdoor facilities as well as world-class restaurants, gastro pubs and wine shops. Visitors planning to attend this year’s hot air balloon fiesta in Clark Pampanga are well advised by travel agencies and tourism guides to stay an extra day or two in a good resort in Clark to enjoy the laidback leisure lifestyle that this vacation destination north of Manila is famous for. Wine and dine at a fine-dining restaurant in Mimosa after a game of golf in one of the several championship golf courses inside Philippines Clark Freeport Zone. Check out the exotic nightlife entertainment just outside of Clark in Angeles City. Overnight accommodation options include hotels in Angeles City and inside Clark Freeport itself. Angeles City offers glamorous and exciting nightlife entertainment that represents an attractive proposition for are well known among frequent travelers and tourists that visit the Philippines frequently. Clark is not only famous for the Hot Air Balloon Festival, the international airport, golf courses and casinos, but this city near Manila is also well known for its fine dining restaurants. To cap off a memorable day in Clark, many visitors make a reservation to wine and dine at the famous fine dining Yats Restaurant and Wine Lounge located inside Mimosa Leisure Estate. Here wine lovers enjoy a delicately prepared wine-paired dinner. Even the healthy conscious and the vegetarians get to enjoy a sumptuous meal at this world-class restaurant. Yats restaurant in Clark Philippines offers an award-winning restaurant wine list, top rated fine dining resto bar outside Manila. Each year, world leading wine and dining magazine called Wine Spectator gives out a special award to restaurants offering the best wine selections. The Best of Awards of Excellence is given out to 850 of the best restaurants worldwide. Here in the Philippines, Yats Restaurant and Wine Bar is the only one to receive this prestigious international award. This restaurant in Clark Pampanga is already well known as one of the best restaurants in the Philippines. With this award, this fine dining establishment puts Philippines, Clark Pampanga on the map of the international dining scene.